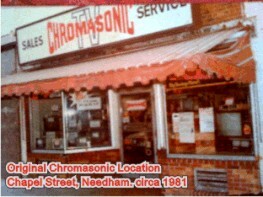 Serving Needham and its surrounding communities for over 35 years, Chromasonic TV has built a reputation as an helpful, and community minded business. Over time, Chromasonic has adapted with the ever changing world of consumer electronics. 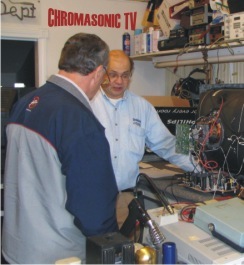 At the start, Chromasonic began with a focus on television repair. Dave Oberman and his then business partner, Bill Galanis, began fixing televisions and VCRs in Chromasonic's original Chapel St. location. Feeling the squeeze for more square footage, Dave and Bill moved to a second Chapel St. location, adding movie rentals to their repertoire and a new found focus on television sales. Soon after, Bill decided to move into retirement and Dave began to move forward with a new vision for his television sales and service shop. The next generation of Chromasonic is lead by Joel Giacobozzi. 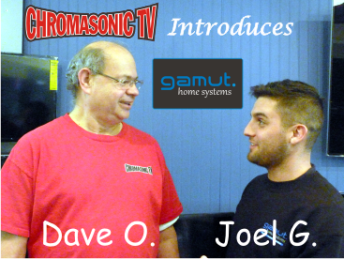 A 16 year Chromasonic veteran, who now leads our newest venture GAMUT home systems the home theater division the development of modern audio visual equipment from the ground level. A true student of his craft, Joel is always researching the latest and greatest devices in an effort to stay on the cutting edge of technology for his customers' sake. Chromasonic TV continued to grow on a foundation of loyal customers that understood that a business with integrity, knowledge, and entrepreneurial drive was worth supporting. Dave O. quickly gained a reputation as local business owner that was willing to work for his customers. Today, Chromasonic TV is in its third location. The newest shop is small and is a reflection of a more focused business model. We have distilled a variety of products and services to three main areas, television sales, television service, and custom home theater installations. 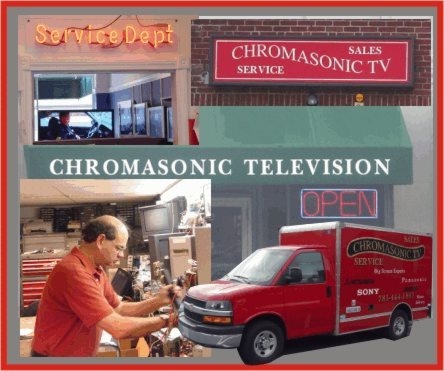 The service department at Chromasonic TV is a factory authorized service center for major brands such as Sony, Samsung, Panasonic, LG, JVC, and many more. Our technicians are all board licensed and each have over 30 years in the service industry. Whether its warranty work or service for your out of warranty piece of electronics, our service staff is ready to get you up and running and back to the entertainment. Chromasonic TV prides itself on providing its customers with a different experience over larger competitors. We know that buying and operating technology, for some, does not come easily, and we are here for our customers every step of the way. Come in to the shop and see why so many have chosen Chromasonic for their audio visual needs. Get the product, get the service, see the Chromasonic Advantage!